The issue of West Papua self-determination and violations of human rights has now progressed beyond the Pacific, says Vanuatu Parliamentary Secretary (PS) for the Prime Minister’s Office, Johnny Koanapo. He said the issue that had Vanuatu as its lone advocator for many years and then Solomon Islands during the last two years now has the support of six other countries of the region from Micronesia and Polynesia. Koanapo briefed the media on how much work government has undertaken on the issue of West Papua. “I wish to say that the government has done a lot of work on the issue of West Papua since the Charlot Salwai government came in in 2016 and the issue remains high on government’s international political agenda. In March this year, the Council of Ministers under the leadership of Prime Minister Salwai, appointed Honorable Ronald Warsal (Minister of Justice and Community Services) to attend the Human Rights Council meeting in Geneva and Koanapo went with him when Vanuatu delivered a statement on behalf of the Pacific Islands Coalition for West Papua. “May be, many people who have been dealing with the issue of West Papua, especially our former leaders like Barak Sope, Donald Kalpokas, the late Edward Natapei, Joe Natuman former Prime Minister now Deputy Prime Minister, have been walking with the people of West Papua for a very long time. “And when we look at the political backup the people of Vanuatu give to the colonised people of West Papua, there’s only one country in the world that has been standing behind people who living under colonisation by Indonesia. That country is Vanuatu. 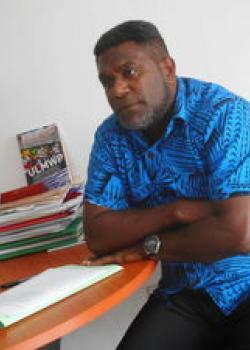 Vanuatu is the only country in the Pacific that is standing behind the people of West Papua. “And then at the Melanesian Spearhead Group (MSG) Leaders’ summit held in 2015 in Honiara, at that time Solomon Islands government through Prime Minister Manasseh Sogavare came on board. And then as PM Sogavare said to me when I represented government at that time when I was Director General of Foreign and also represented the country at the minister’s level that the position or stand the government of Solomon Islands is taking is inspired by the position and stand the Vanuatu government has taken since day one on the since to West Papua to this day. “So, instead of just one in the Pacific, there was two. That’s the Vanuatu government and the Solomon Islands government. Solomon Islands government with the support of Vanuatu spearheaded the formation of the Pacific Islands of West Papua (PIWP) and then other countries of Micronesia and Polynesia have come on board. Altogether eight countries – Vanuatu, Solomon Islands, Nauru, Marshall Islands, Palau, Tuvalu, Kiribati and Tonga. So, Vanuatu, as the lone fighter, now has seven countries behind it for backup on the issue of West Papua. “As a result in March this year, government through the Council of Ministers appropriated for Vanuatu’s participation at the Humans Rights Council meeting this year in Geneva. So, Minister Warsal and I went to the meeting where Honorable Warsal delivered a very strong statement. It was a political statement on behalf of BIGWIP members in the Pacific. “I also wish to mention that when we have this coalition, Vanuatu’s strategy is for us to try shift advocacy for the issue of West Papua beyond the region. When we were introducing the issue at MSG, Vanuatu was the only country behind it. “I am briefing us today as a former director general of the Ministry of Foreign Affairs, who has been behind much of the speeches and writings, to say that I’ve never seen before a government that has taken the issue of WP so strongly as the government of Charlot Salwai and Joe Natuman is making today. “There are reasons for this. In the past governments tended to take different kinds of approaches. Some prefer for us to take a stronger diplomatic approach at the international level to lobby. Some prefer we have more dialogue with the colonising power, Indonesia since 1962 to today that they continue to colonise the people of West Papua. “So, the government of Charlot Salwai also appointed a special envoy. This special envoy was our Ambassador at the European Union, Ambassador Roy Micky Joy, to help lobby at the European Union jurisdiction and he also helped to lobby at the African Union. And he also helped to lobby at the Caribbean. We have divided this task and it is the first time. “May be the Opposition has some views that government may not be advancing, but I have not seen any opposition in the past with the credentials to advance this issue, except this government today has moved this issue on more than ever. I say this with a lot of confidence that the issue of West Papua today has already moved beyond the region,” the PS for the PM’s Office said. “This government when it came in, it took this issue from being a bilateral issue just of Vanuatu, but a regional issue, which we have moved beyond the level of MSG in which we have differences of opinion on how we deal with the issue of West Papua because of the presence of Indonesia is strong. This made Vanuatu the only country in MSG to push the issue ahead. But the issue has now moved beyond the jurisdiction of MSG,” he said. “I wish to take this opportunity to commend the Secretary General of the Pacific Islands Forum, Dame Meg Taylor, a very proactive SG who understands the situation of the people of West Papua who continue to face human rights abuses on the own land. I note too that when we were at the Pacific Islands Forum last year, PM Salwai convened a number of bi-laterals with many countries to push for the issue of West Papua, to come before the Forum Leaders retreat. And at the retreat, PM Salwai took the lead on the issue of West Papua. Because the PM of Solomon Islands was not present so PM Salwai had to do the lobby and he continued to put the issue on the table and he continued to advocate for the issue to come before the United Nations. “PM Salwai also appointed me as his Special Emissary to undertake shuttle diplomacy in the region, starting last month when the Pacific Islands Foreign Ministers meeting was held in Suva, I went there as special emissary of the PM to present a case at bi-laterals of member countries to talk about the importance of how PM Salwai and PM Sogovareh see the issue of West Papua. “I also wish to mention to the people of Vanuatu to understand that when the government of today says that we are shifting the issue of West Papua beyond MSG and beyond the region, it simply means also the level of work government is making outside of the region. In around June this year, at the ACP Ministerial meeting in Brussels, the government assigned me to attend this ministerial meeting with Minister Ralph Regenvanu because Minister Regenvanu was engaged with other assignments, I undertook this assignment on behalf of Vanuatu where I tabled the issue of West Papua for the first time in history as an agenda at the ACP Ministerial in Brussels, Belgium. “I also wish to place on record for the people of Vanuatu to know that government also assigned Ambassador Roy Mickey Joy to do this work in his capacity at the Committee of Ambassadors at the process of ACP to table the issue of West Papua at the Committee of Ambassadors level. The Committee of Ambassadors is comprised of Ambassadors and senior officials of countries based in Brussels to continue to discuss the agenda and formulate resolutions to come to the Ministerial level and at the Ministerial they took up this agenda before it reached the leaders’ level. “It was the first time too I lobbied with the Secretary General of ACP to continue to maintain this agenda item at the ACP. “I believe strongly that the government will continue to participate at upcoming ministerial meetings and this issue continues to feature prominently in the agenda of ACP. “At the same too, with the help provided by the Vanuatu government mission in Brussels, we see a website totally dedicated to ACP and European members to access information on what is happening in West Papua. We all know that today West Papua is a flashpoint, an area of conflict between Melanesia and the Asians, but not country is willing to take this up. We all know too that West Papuans today face a reality of genocide including cultural genocide where thousands of Indonesians everyday flock into West Papua with their immigration policy, which means that the Melanesians will find themselves already a minority in their own land. This is the reason why the people at the time of the New Hebrides were afraid of at that time pushed to have our independence because our land was alienated so much that we were afraid of losing it and our identify. This is an opportunity that the West Papuans have today. “Interestingly, when I conducted a bilateral in June with the government of Belgium, they said they were never aware of West Papua. The issue of West Papua is an issue hidden under a carpet because the press was never allowed to go freely to see the people and to hear from them what happened and their views on the destiny they see for themselves. It is a sad reality that is there. “The issue now has progressed to the international stage and I say this with a lot of confidence that the issue has never taken so much international attention as it is today simple because the government is serious about, there is no second opinion on it as to whether the government will take up the issue or not. “The government has taken on this role because it is a global country and we are global citizens with obligations to defend such things as human rights, which are parts of the rights of a human being. In addition to all these, the Prime Ministers of Vanuatu and Solomon Islands are organising a side event at the UN General Assembly in New York next week to continue to lobby for West Papua, so that when leaders make their political statements at the GA these will reflect these efforts.